Last night, I was looking through Instagram at the suggested photos to check and I saw Local Edition's post about a corner at their shop where people can trade books for free with the title The Book Project Manila. 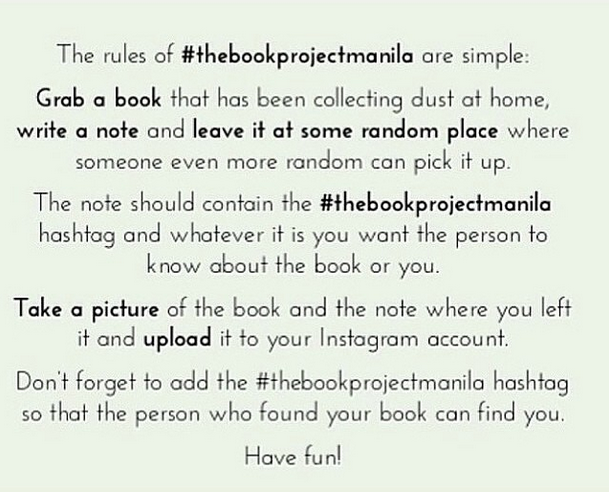 What got me even more curious was the hashtag #TheBookProjectManila which was actually a project to spread the love for books. It makes the book find its new owner and avoids it from accumulating dust at your book shelf. Why was I attracted to the idea of giving away my books instead of selling them? Let's face it. Book lovers have this guilty habit of buying books and leaving them unread for a very long time and even to the point of not being able to read them (I'm guilty as charged of this!). I tried selling my books online but for some reason, shady human beings were gravitated to my ads and they were a little creepy so that didn't turn out very well. I've already donated two S & R eco bags' worth of books at the local library where my mother is working. So this idea of The Book Project Manila of just leaving my books to find their new owners appealed to me very much. So I decided to part ways with my 7 books and wrote notes which I put in them. I used this back in college and I think someone else might find this useful for school. Also, I'd be amused if I went to the ATM machine and got a free book! I know it is highly unlikely for someone to find it at the beaten down place where I left it but that makes this exciting. This is a diary-type biography of Ken Fischer and how he became one of the most-celebrated investment gurus. I figured someone who will hang out at Starbucks might want to learn about portfolio management. Is it likely that a high school girl will drop by this milk tea place and get this book? I used this back in high school for my English class. I was never a fan of mythology but I know lots of people who are (but I didn't give this to them and instead just left it randomly in the mall, haha). I thought someone who'll come in Jollibee might want some nostalgic feels or have been meaning to buy a Bob Ong book. Hopefully, I'm right. I hope the person who'll buy this rack was intending to sort out his/her books and find this! I took the harder route instead of just going to Local Edition to swap books since I wanted to walk around and have a little adventure. So, you want to take part in The Book Project Manila? It may seem like "Oh, that's relatively easy. I just place the book on top of the ATM Machine." That's a big fat WRONG right there. There are a lot of people at public places. The security guards are either roving around or stationed at one spot. You don't want to be mistaken for someone hiding some destructive paraphernalia or trying to drop weird stuff at public places. 1. Strategize beforehand where you'll drop off your books. This helps you minimize the time in dropping off the books since by the time you go out, you already know exactly where you're going. This also makes the task organized too. 2. For restaurants or cafes, choose crowded ones. I initially thought of leaving a book at Yardstick but then I thought the place is not packed at this time. It will be too obvious if I go in just to leave a book. I opted for Starbucks and the milk tea place since there were many people there and not much attention will be drawn to me. 3. For retail shops, choose the area where not a lot of people are concentrated when you come in. I chose the corner at the storage solutions thrift shop since most people were looking through at the other end of the place and I knew that more people will be going there in the next coming hours. Also, the sales people were far away from there so no unnecessary attention was caught. 4. Take photos using your camera phone and not with a digicam / DSLR. You have to take photos fast if you want to document your book drops. Using a digicam or DSLR will get attention to you when doing this. I used my phone's camera to take the photos above but I still drew some attention. I just ninja-ed my way out. 5. Limit the number of photos you'll be taking of the book you'll be leaving. This is co-related to tip no. 4. You do not have the privilege of time to art direct the shots so just take 2-3 shots at the most. I will be doing on some other locations and I hope the people who'll get my 7 books will be happy with their finds. Who knows? Maybe one of these days, I might be the one who will find a book to take home because of this project. Oooh, interesting! I'd rather give books to friends tho. Also, Mythology is one of my favorite books, probably the most important book in my life haha. I wish I still had my HS copy. This was really interesting to read. More power to you Kristel! I hope I could pick up a book one day, although I have some unread books still. Haha! OMG Memoirs of a Geisha!!! UGH I wish we'd have this project here in Davao. This is great! Great idea! Hmm maybe I should do this with my old books too. I have that mythology book. Interesting project! I might do this with books I didn't have the interest of reading! Haha. Although I would be a bit more careful where I leave books. The ATM idea may seem interesting and tempting, but tight security might see the books thrown into trash. Sayang naman. I think banks are allowed a bit of paranoia when it comes to things left behind. They might see it as a secret code between thieves or something! What!!! What an awesome idea! I love things like this -- I'd love to find something similar in LA and participate. Very cool. This is awesome. It's time for book hunt. Lols! I'll be dropping books on random bus' seats tomorrow.